Filters and Effects describe almost any action that can be taken on all or part of an audio track, that changes how it sounds. These can be as simple as making it louder or it could be complex such as applying Point Cast Distortion. 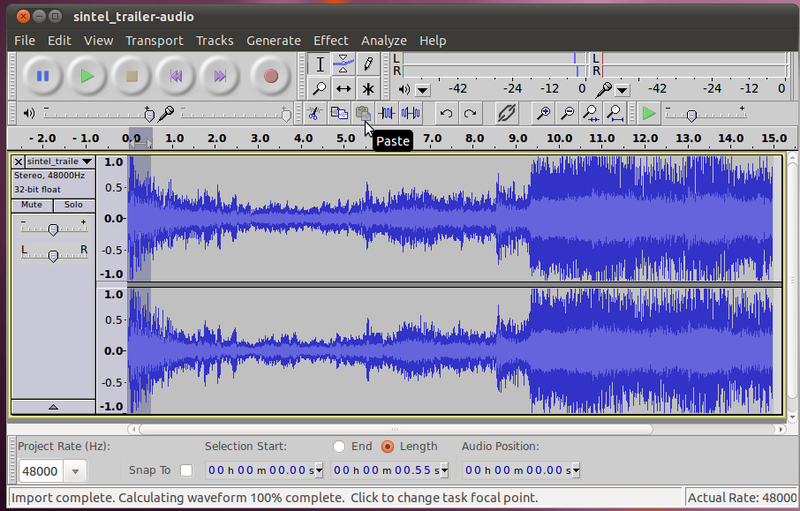 There are over 125 different effects that come with Audacity, and even more can be found online. The use of all of these filters, unless otherwise specified, acts on a selection of audio. You can use the selection tool to make selections by clicking and dragging over the area on the waveform you want to select. To select the entire audio track(s) you can press Ctrl+A. For these examples, lets start by downloading the male track from last time. The most basic task that you would typically come across when working with an audio track would be to raise or lower (amplify) the volume for a portion of the track. 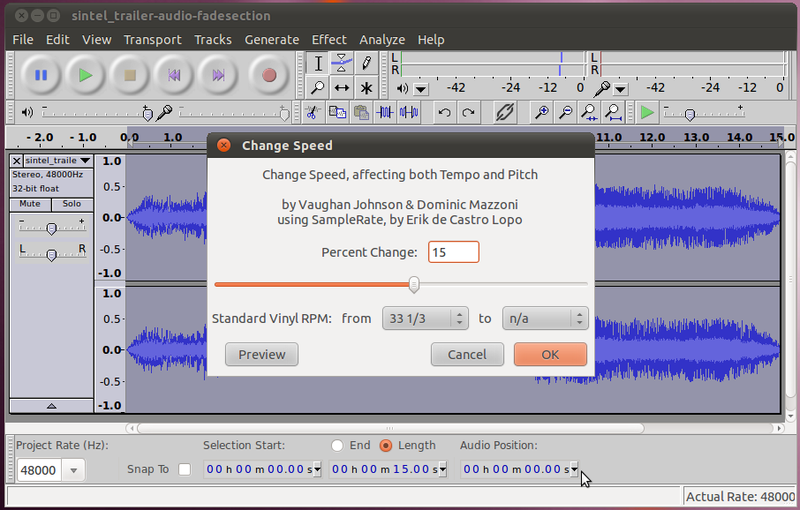 You may remember from the last section, that it is possible to raise or lower the volume of an entire track by using the slider to the left of the track, however that won't work for only a portion of the track. Lets make a selection and then go to to Effect -> Amplify. You will have to choose an amount of amplification in dBs. Zero dBs won't change the selection, something greater than zero will raise the volume, something lower than zero will lower it. 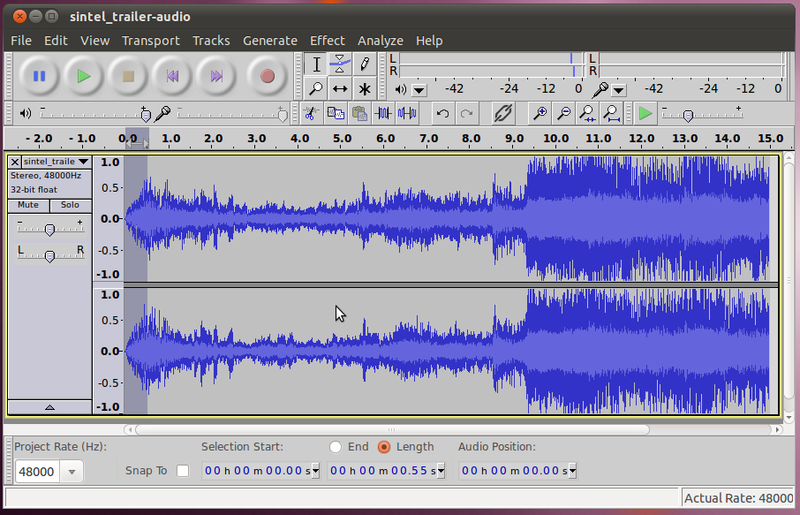 It is possible to slide it so far to the right that part of the audio goes beyond what is capable of being played back (past 1.0 on the scale), this is called clipping. You can check the box to allow it if this is what you want, but it will sound bad. 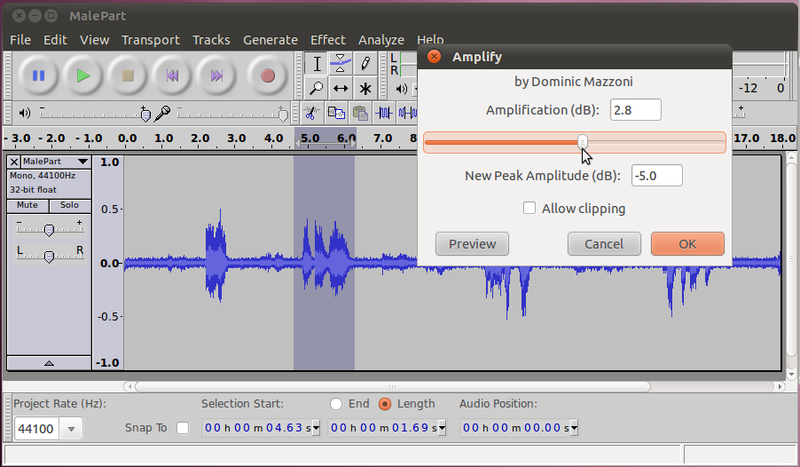 The New Peak Amplitude is the maximum amount of amplification you can apply without clipping. Here is what it looks like with a rather large amplification. Normally this would probably be far too much, but it was exaggerated for the sake of emphasis. That's all there is to amplification. You may have noticed that in this clip, there is a substantial buzz/hum in the background. This is annoying and makes it harder to listen to, so we would like to remove this. 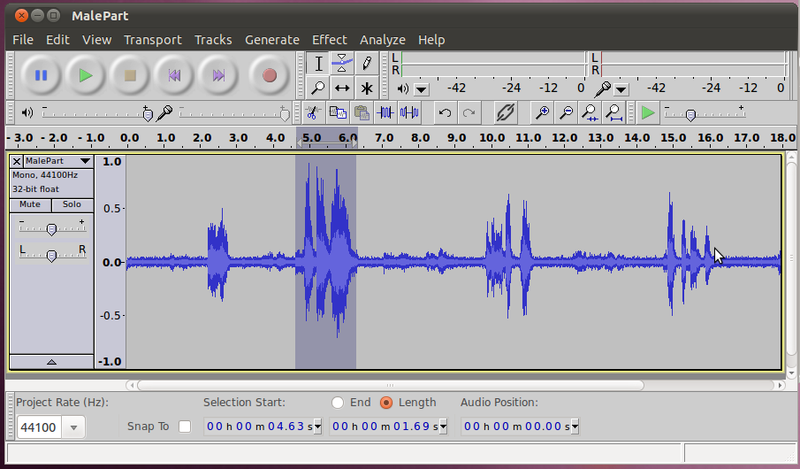 For the areas where there is only the background noise but no talking we could just use the silence or envelope tool to remove them, but unfortunately (as is common) the background noise continues even when the person is talking. To remove this from everywhere, including the important audio, we'll use the noise removal filter. We'll start by selecting an area of the audio that ONLY has the background noise. It is important that there isn't any other noise here, as the filter will create a profile based on this, that will be applied to the whole clip. Once we have our selection, go to Effect -> Noise Removal. 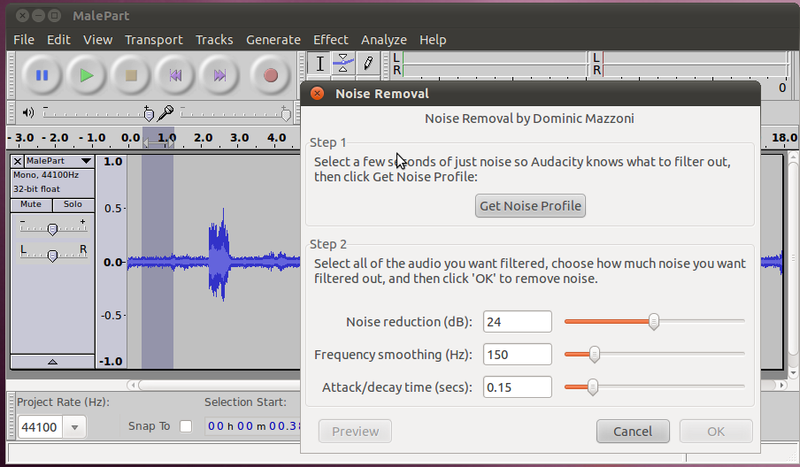 Click "Get Noise Profile" to use the selected area as the profile. Now we'll go back and select the area that we want to remove the background noise from (probably the whole clip) and go back to the Noise Removal effect. We're now in step two, applying the filter. We can probably just leave the settings at their defaults of 24db, 150Hz, and 0.15s. And hit OK. 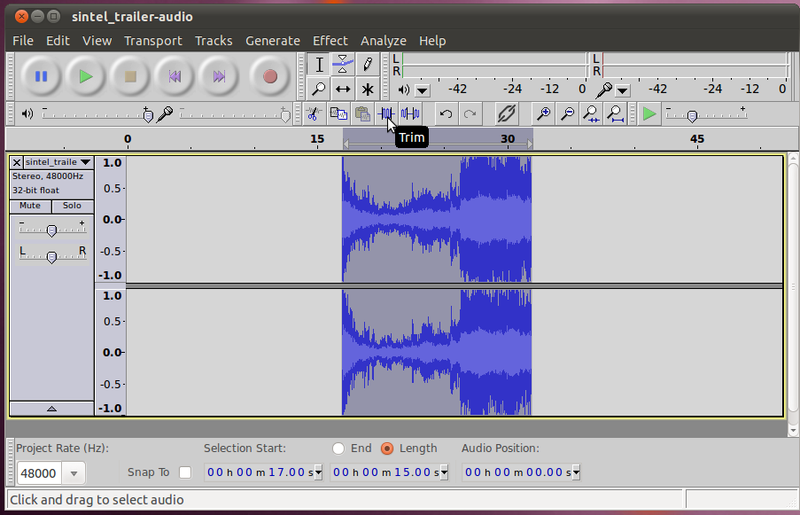 Listen to it to hear the difference (hit Ctrl+Z to go back and hear the old one too). If you turn the volume up, you can still hear some noise in the quiet parts, but it is much better now, and not noticable during the talking. If you want to fix up the quiet parts further, you can use the silence or envelope tools. Once we have our selection, we'll cut everything else, so that we only have our selection remaining. Instead of using the normal cut button, we can use the trim button to remove everything else in the clip. Finally, use the time shift tool to move it to the beginning. Now that we're all set, we can start editing this clip to make it sound good. One of the first things we notice when we listen to it, is that it starts and stops very suddenly. To smooth out that transition, we'll use the Fade In and Fade Out effects. To start using the Fade In effect, we will select the area we want to apply it to. It doesn't take much time to make a good fade in, so lets select the first half second or so. Now that we've got it selected, run Effects -> Fade In. You can listen to the start of the clip and hear a big difference in the two starts. Our new one with the Fade In is much smoother. For the fade out, we'll make it a bit more gradual (because there's a lot of sound immediately before that), so this time lets select the final one second (or so). Run Effects -> Fade Out. You can listen to the end of the clip and hear that the fade out makes it much less jarring of a drop off. 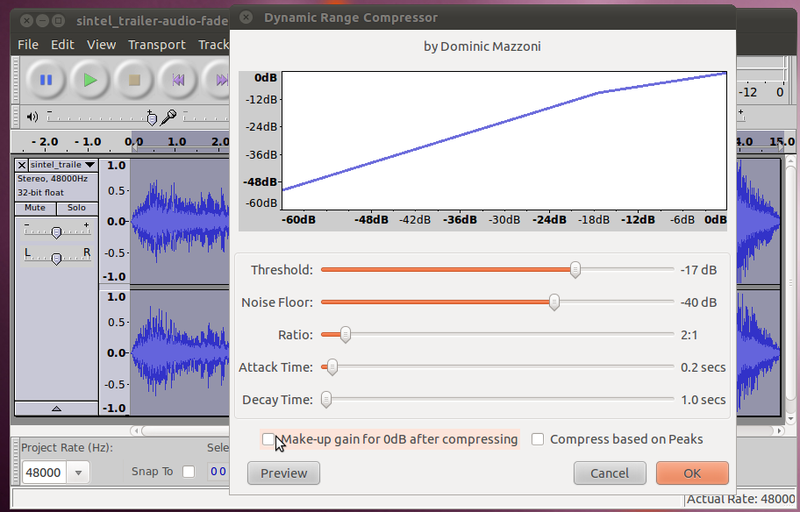 Threshold - the volume level at which compression starts to be applied. 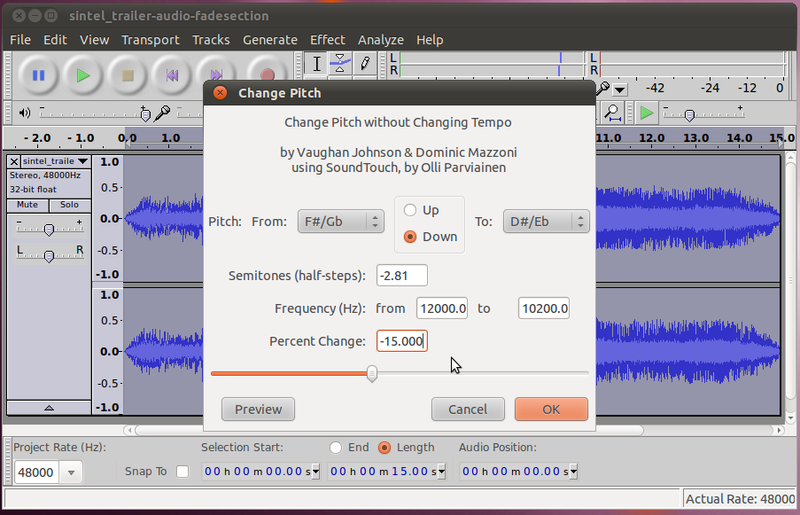 The further right the slider, the louder the input has to be before compression is applied. Ratio - if the level is above the threshold, how much it will be reduced. 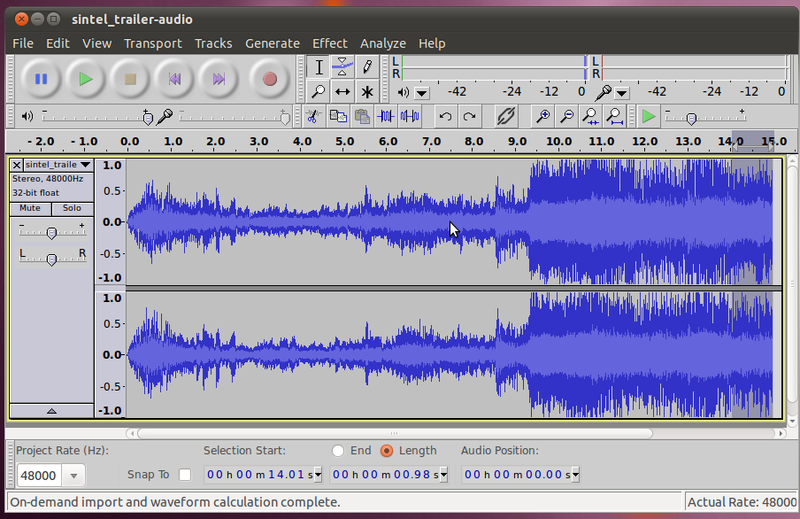 For example, a 3:1 ratio implies that a passage in the original audio that became 3 dB louder would only become 1 dB louder in the compressed result. The further the slider is to right, the stronger is the compression applied. 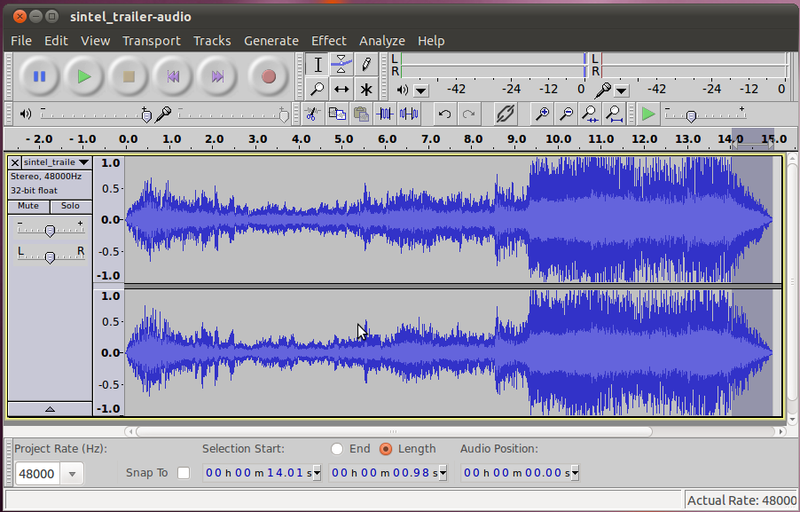 In Audacity it is easy to apply the compressor, just select the audio you want to compress (all from this clip) and then go to Effects -> Compressor. Here you can set the values explained above (or leave the defaults). Then click OK.
You will see that the loud audio section from your track has been lowered down a lot while the quieter section hasn't been changed very much. If you listen to the audio, the part where it gets loud isn't nearly as overpowering anymore. Until now we've been looking at ways to basically clean the sound up. However, it is also possible to use effects to make it sound all-together different. There are many ways of doing this, but the two most basic ones are changing Pitch (how high or low the sound is) and Tempo (how fast the sound comes). From a theoretical standpoint it is difficult to change either pitch or tempo without affecting the other. Typically, changing either of these involves changing the speed. If you change the speed faster, the tempo gets faster along with it, and the pitch goes up (think of how high the voices sound when you fast forward through audio). When you lower the speed so it is slower, the tempo slows down and the pitch goes down as well, giving voices a deeper sound. 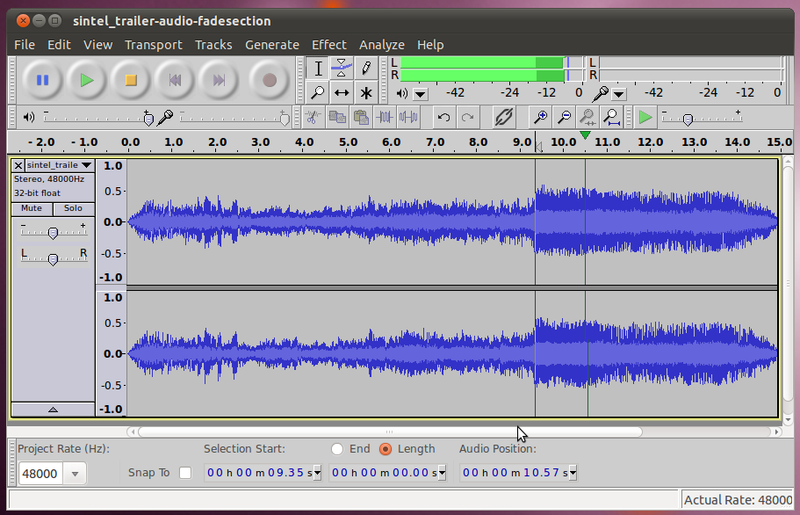 This can be done by using the Effect -> Change Speed... tool in audacity. 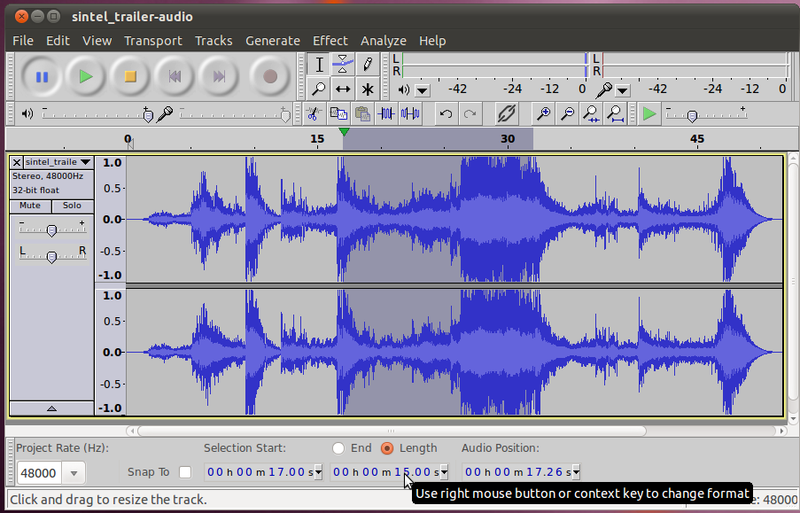 In addition, audacity has built in the (quite complex) ability to change either the Pitch or Tempo without affecting the other. Lets give all three a try. First, lets select our entire clip, and choose Effect -> Change Speed... On the dialog that comes up, increase the speed by 15% and click OK. You will immediately notice that the clip has gotten shorter (by 15%). When you play it back, everything will sound like it is coming fast, and the voice of the woman in the first few seconds will sound very high. Once you've seen these results, undo that change, and we'll try the next one. Again, with the entire clip selected, choose Effect -> Change Tempo... On the dialog that comes up, again, increase the tempo by 15% and click OK. Again you will see the clip get shorter. This time when you play it back, it will still sound like it is coming fast, but the voice will be about the same as it was in the original. When you're finished trying this out, undo your change so we can try the next one. 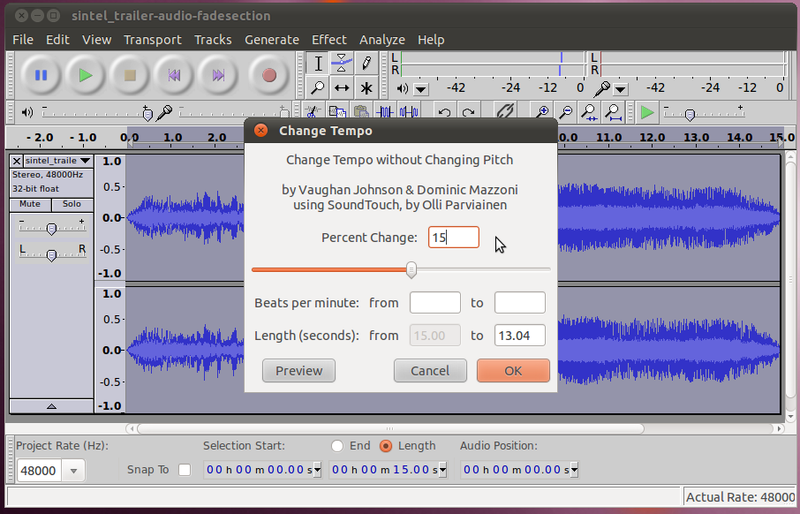 Finally, with the entire clip selected, choose Effect -> Change Pitch... This time on the dialog that comes up, reduce the pitch by 15% and click OK. In this case, the length of the clip will stay (approximately) un-changed. However, when you play back, the woman's voice will sound lower, almost like that of a man! 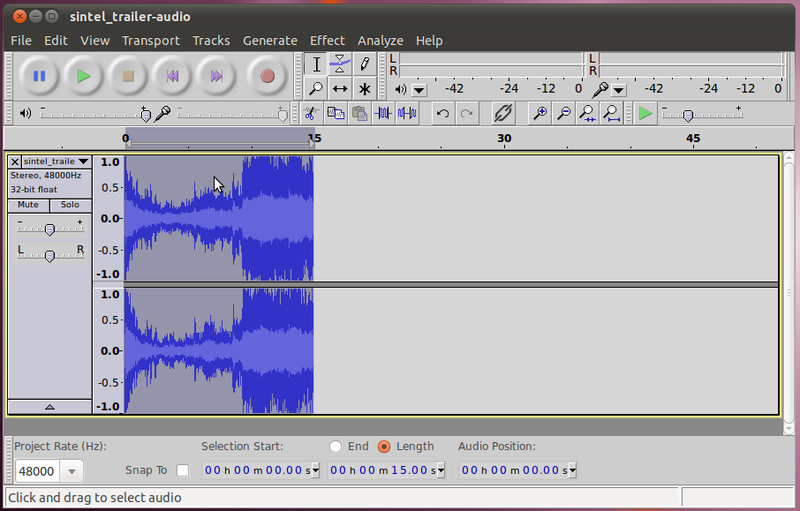 There are a whole slew of more effects built in to Audacity. In addition, Audacity has a plugin system that allows other developers to load their own plugins, so there are even more (114!) that come with the version that gets installed into Ubuntu. 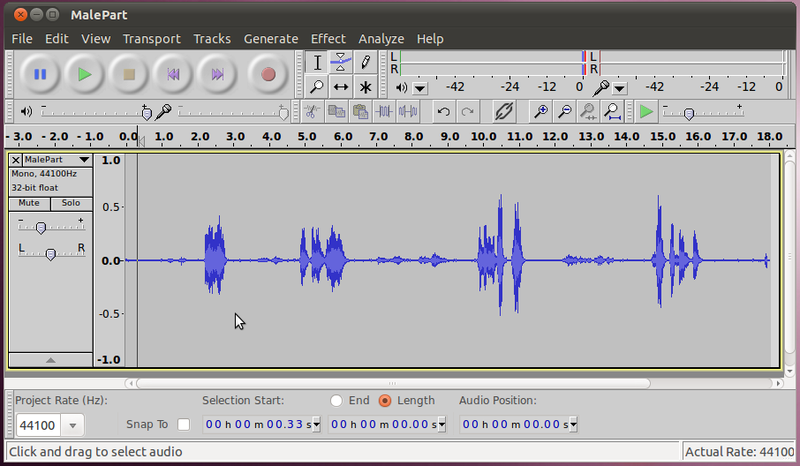 Beyond that you could go out onto the internet and find plugins of the LADSPA, Nyquist, or VST type and load them into Audacity as well. Spend some time playing around with the different plugins and see what sounds you can create!